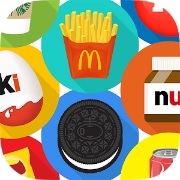 Guess the Food Brand Quiz has more than 7500 brands to guess. We’ve collected the answers for you so you can solve your level when you’re stuck in the game. Choose the region where you need the answers for below. You will find every solution for the region. Prevent that you need to wait for 24 hours when guessing the wrong answer. Look for the right solution on this page so you can keep on playing. Every region has several levels which contain multiple quizzes. We’ve separated them on different pages so you can find all the correct answers easily. Just go to the page for the region you are playing to find all the levels.